Bosch has officially announced the new GLL2-80 line laser, big brother to their GLL2-50 line laser. Let me just start out by saying that I love the GLL2-80, I have never used it or even seen it in person, but I love it. Why, because it can project a solid 360-degree laser line on both vertical and horizontal planes. Typical lasers in this class can only do solid laser lines at around 180 degrees. The only other option for 360-degree laser accuracy is a spinning dot laser, but these cost much more and can be harder to see. Bosch is able to create 360-degree lines in the new GLL2-80 laser with their new proprietary cone mirror technology. This tech, in conjunction with the lasers self-leveling pendulum greatly reduces the number of moving parts. This not only saves on battery life, but also extends the life of the tool itself. When the laser is in the off position, the pendulum automatically locks for added protection during transport. The GLL2-80 is accurate to 1/4 inch at 100 feet which is typical for this type of laser, but its range can be extended to 265 feet by setting the tool to Pulse Laser Receiver Mode and using an optional LR2 Laser Receiver. The Bosch GLL2-80 comes complete with a hard case, WM1 Positioning Device, instruction manual and four AA batteries. 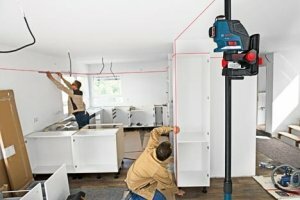 The WM1 is a great laser stand that Bosch is including, but if you need a little more flexibility, you can also mount the laser to any 1/4-20 or 5/8-11 tripod or laser stand.